Hey everyone! Today I’m doing a guest guitar lesson with Utah Guitarist, Jami Taylor. I met Jami recently on Pinterest and we became fast email guitar buddies. 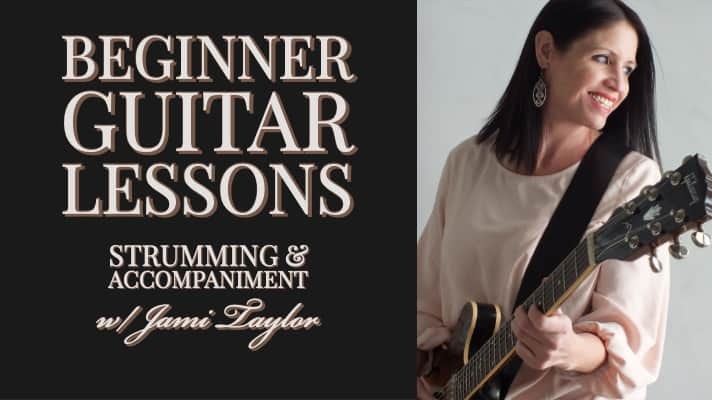 Jami has a wonderful gift for beautifully designed, easy to follow, visually appealing guitar lessons. I just love her website and her beautifully styled lessons are so different than mine, I just had to have her do a guest post here at Lifein12Keys.com. Hopefully it won’t be her last! 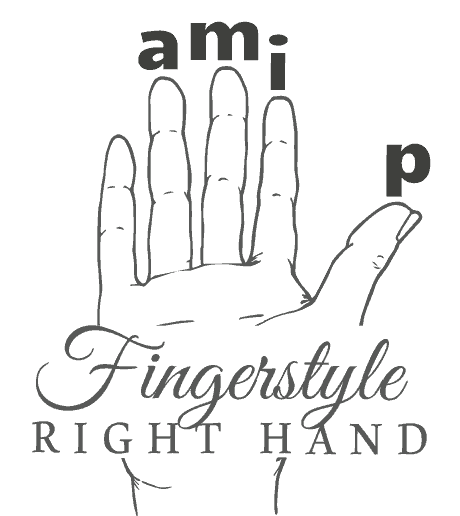 Jami is a professional guitarist with Bachelor of Music in guitar performance. 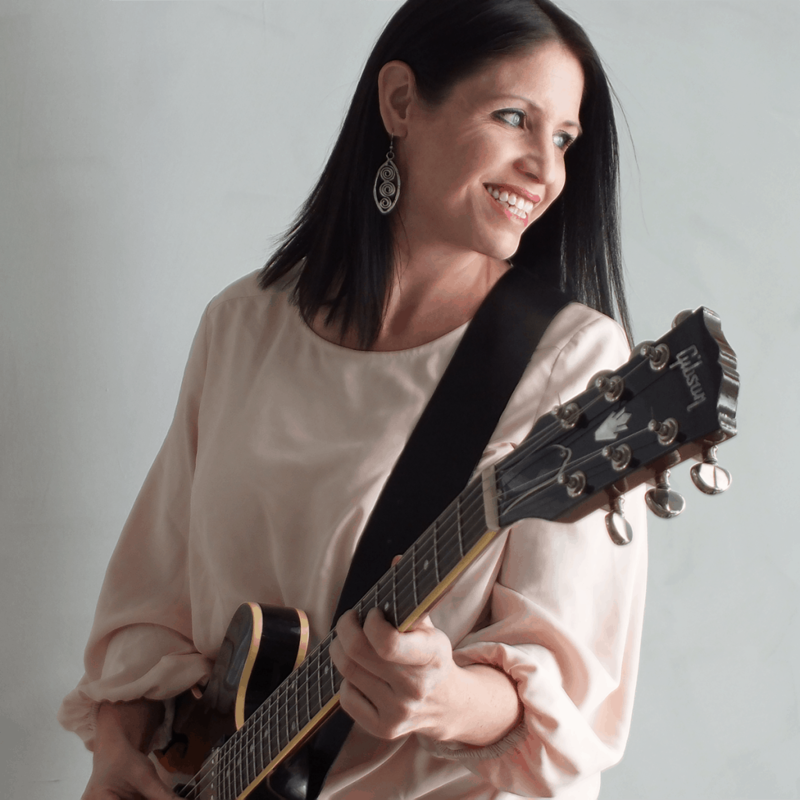 She teaches guitar privately, in group classes and through her new website, modern guitar approach. Jami also performs solo acoustic guitar and is the lead guitarist for the band the Mothers of Mayhem. 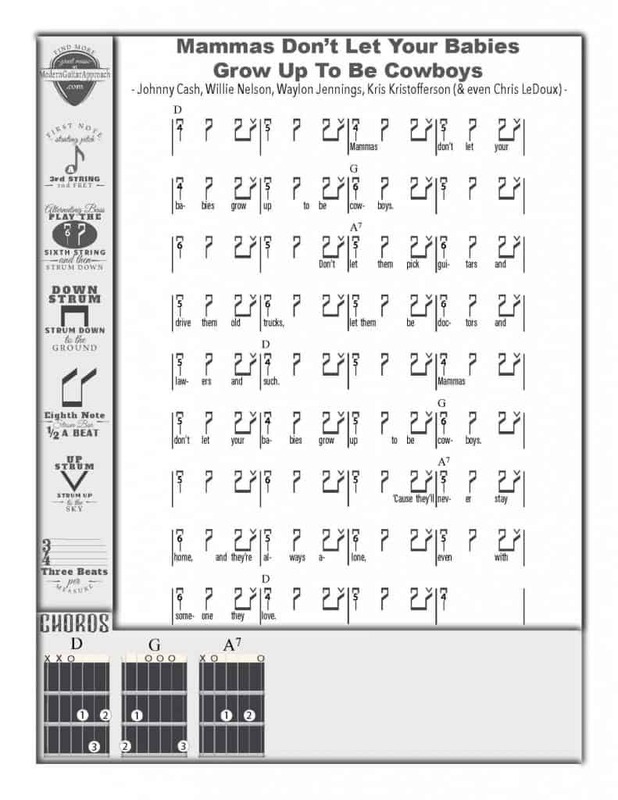 I took quite a few guitar pedagogy classes when I was in college studying guitar performance. 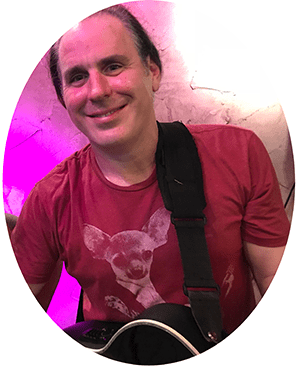 One of the first classes I took explained the 3 main types of accompaniment methods on guitar and how to teach them to others. To accompany on the guitar means that you are playing the chords to a song while you or someone else sings the melody. 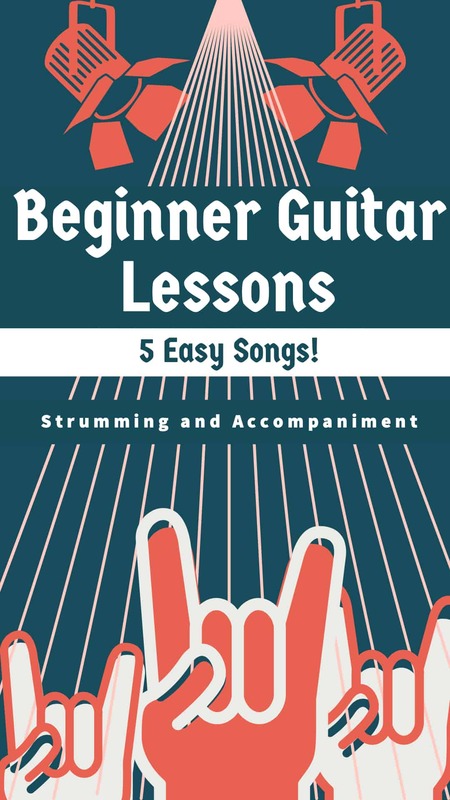 To show the three different types of accompaniment, I have included 3 different easy beginner songs. 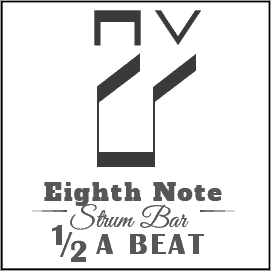 When two strum bars are connected with a beam you get eighth notes and both are strummed in one beat. To do this, you strum down on the first one and up on the second. 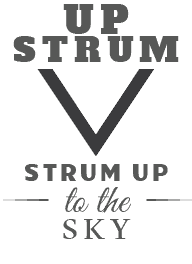 For those who are familiar with strum patterns already, you may want to try a syncopated strum pattern instead. 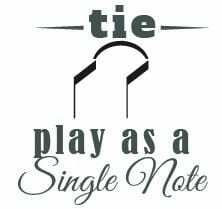 To play a syncopated strum pattern, you first need to know what a tie is. 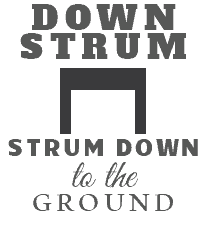 When playing a tie, you play the first strum bar and hold over for the duration of the second. Alternating Bass is a guitar accompaniment style that is used in bluegrass, folk, country and is even found in other music styles here and there. This is a great way to accompany a song because it almost sounds like you’ve brought a bass player along as well. 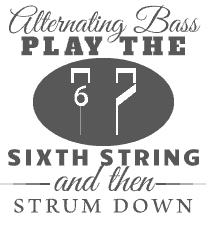 Alternating Bass means that you play the lowest note of the chord, strum the higher strings and then play an “Alternate Bass” note and strum the higher strings again. This “Alternate Bass” note is sometimes on a lower string and sometimes on a higher string. I’m going to show this concept with Mammas Don’t Let Your Babies Grow Up To Be Cowboys. This song is in 3/4 time, which means you have 3 beats in a measure. When playing alternating bass in 3/4 time, you play a bass note and then strum for two beats and then play an alternating bass note and strum for two more beats (assuming you haven’t switched chords yet). I also added an eighth note strum pattern in to make the song a little more interesting to listen to. 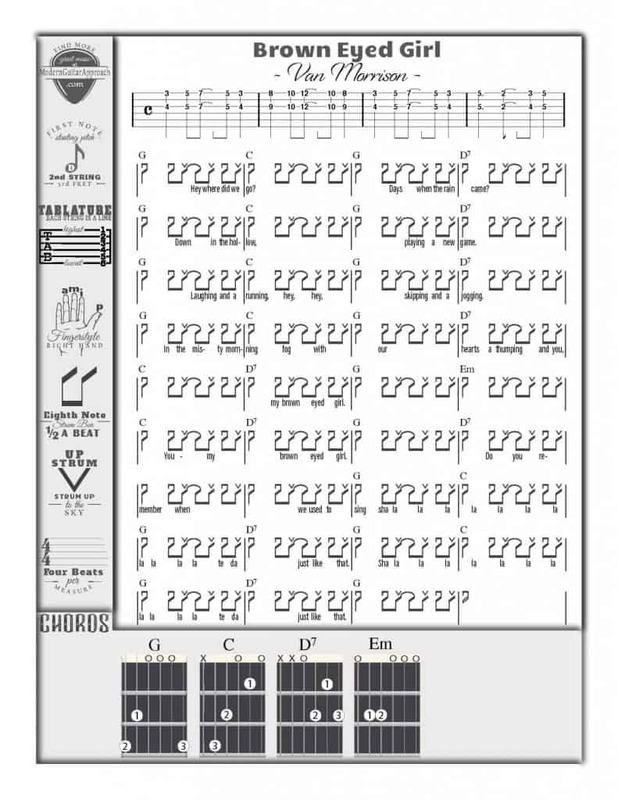 Pattern picking (also called fingerpicking accompaniment style) is when you hold a chord and then play the strings with your fingers (instead of a guitar pick) in a specific order and then repeat that order until the next chord. 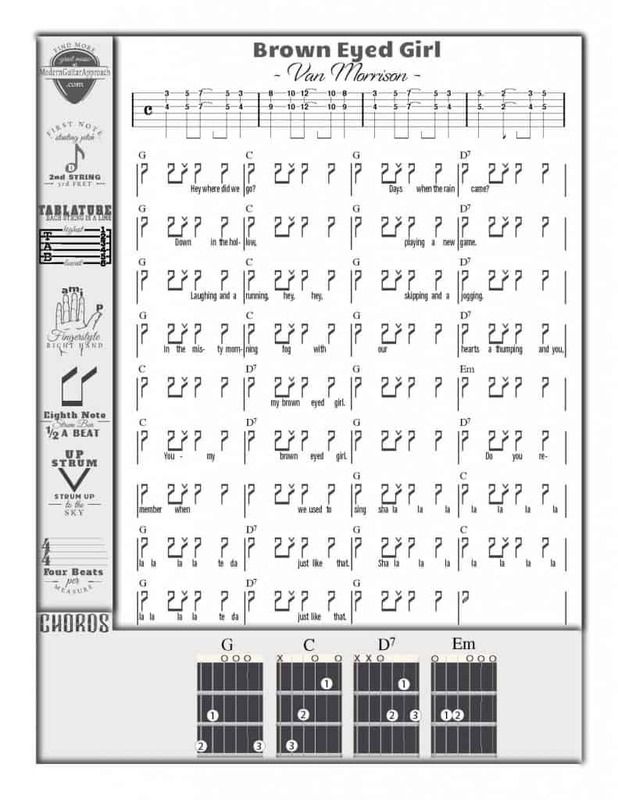 It’s easiest to divide these patterns into three categories; 4-string, 5-string, and 6-string chords. 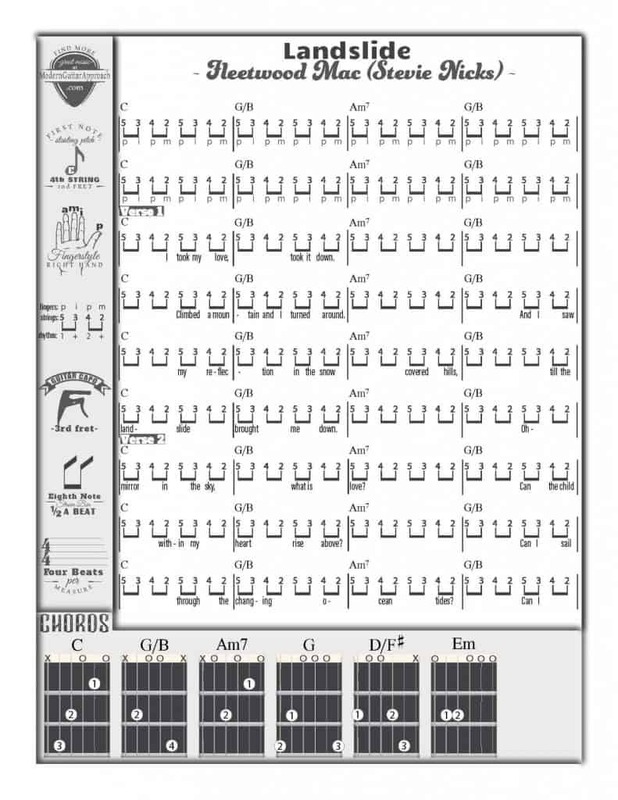 Also, make sure you put that capo on the 3rd fret for this song! Let’s use the song Take Me Home, Country Roads by John Denver to further illustrate the concept of strum patterns, alternating bass & fingerpicking patterns. I picked this song because I’ve heard it played with all three accompaniment patterns in the past and they all sound great! 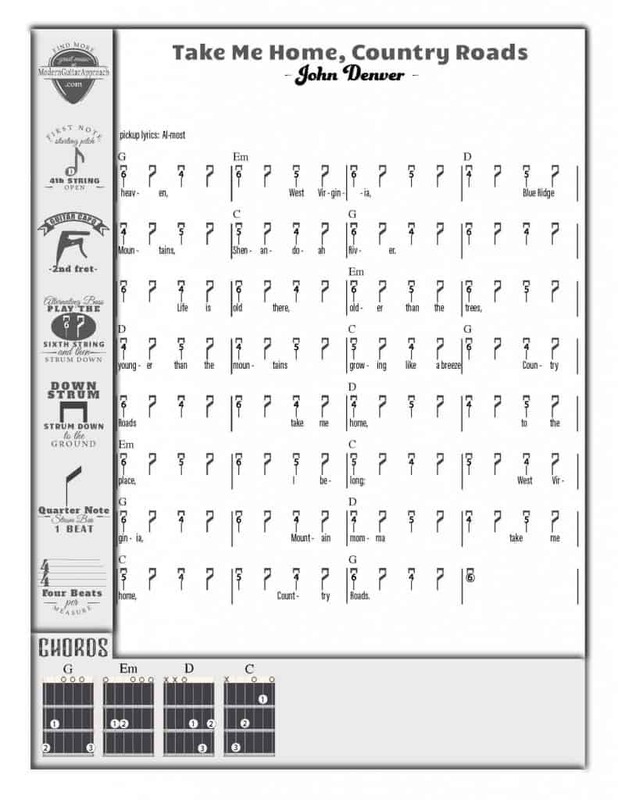 It is also an easy song to work with because it uses beginner guitar chords. If you want the song to sound like the original, be sure to put your capo on the 2nd fret. 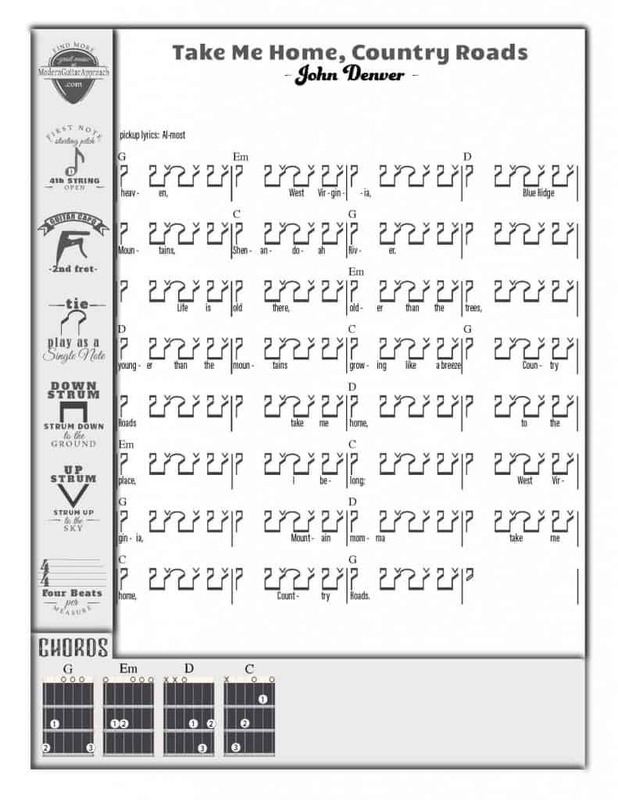 Here’s Country Roads using the syncopated strum pattern that was shown earlier. 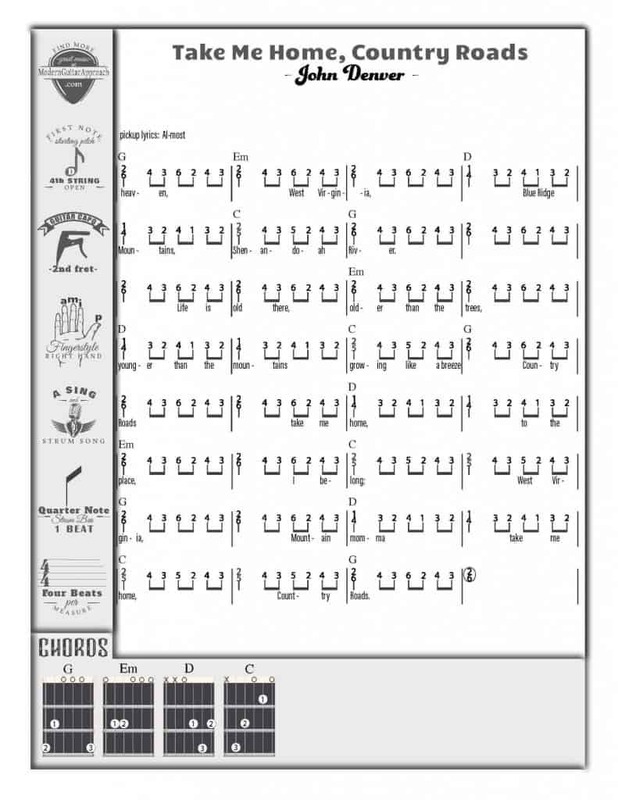 Next, I’ve written the same song using alternating bass. 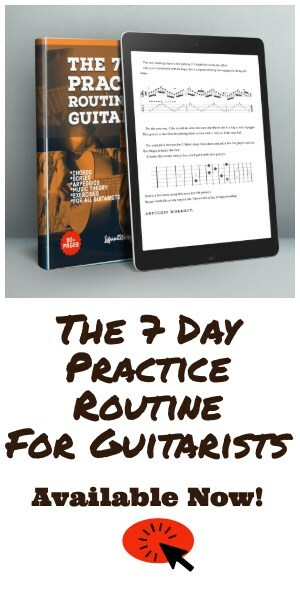 This will also show you how you can play alternating bass in 4/4 time. Lastly, here is Country Roads using fingerstyle accompaniment. The pattern I’ve used is called Travis Picking Style. This style was made famous by Merle Travis. To play this style, you play two notes together for a quarter note on the first beat, and then play the rest of the pattern as eighth notes. 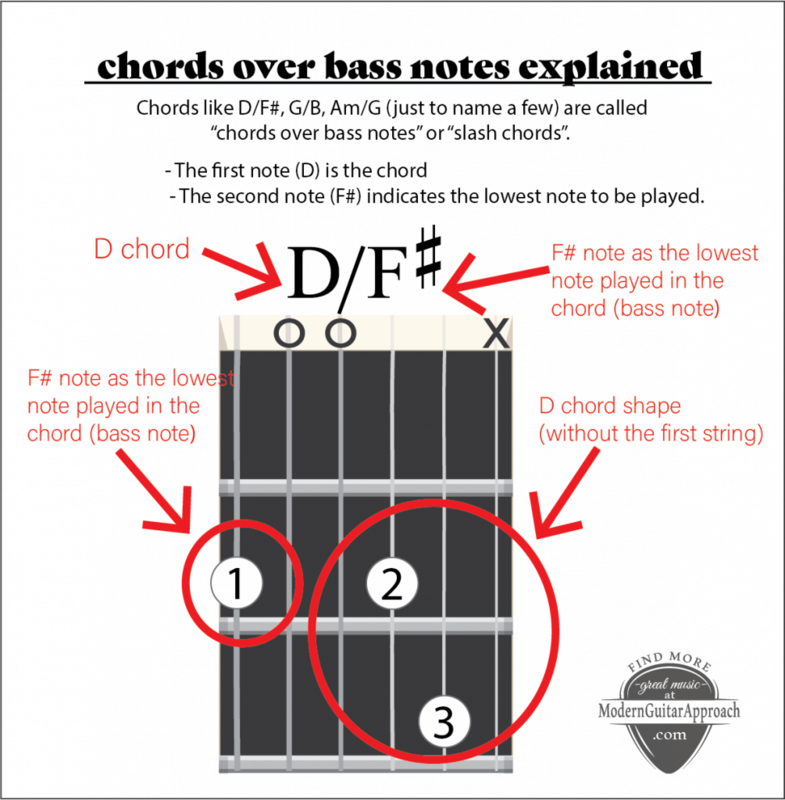 Here is how the pattern looks broken down by how many strings you play for each chord. 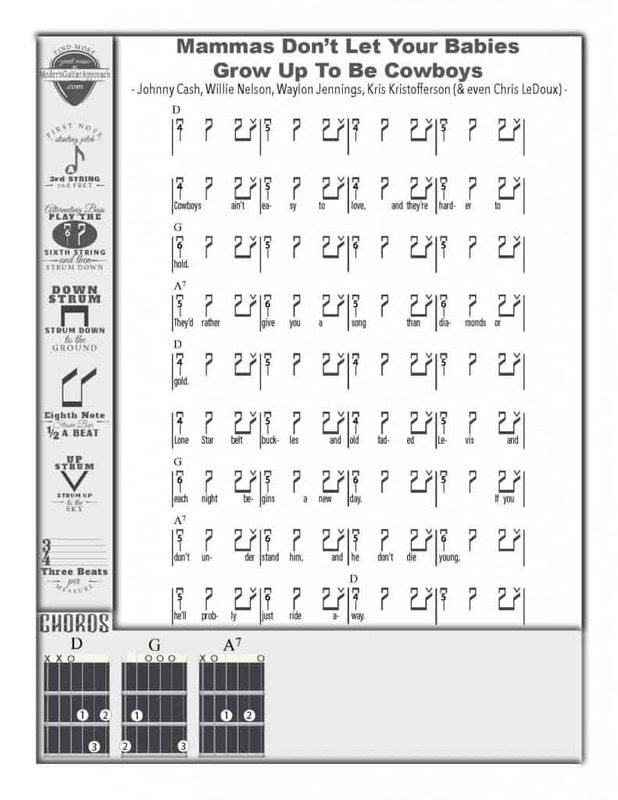 As always you can get a high quality FREE printable .PDF file of this lesson including all 5 Songs delivered right to your inbox.